The workshop was founded in 1973 as Borås printmaking workshop and moved under it’s present name to Ålgården in 2000. It’s runned non-profit by an association of professional artists with support from the municipality and has today about 110 members (key holders). We also offers guests to come and work for a period of time. 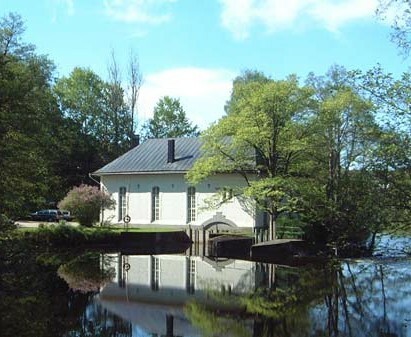 We are beautifully situated at Ålgården by the river Viskan in Borås near the west coast of Sweden. At our disposal we have four larger buildings and two outhouses in a smaller park area. In the maim building we arrange exhibitions by both national and international artists. We also arrange courses in different techniques. The workshops are divided into three – one for lithography, silkscreen and glass – one building for intaglio printing – and one for a digital workshop, kitchen and guest rooms Just behind a small hill there is Knalleland where you find all kind of shops.